Radio C, the Roma station in Budapest, has stopped broadcasting news in Romany. The reason? - there aren't enough Romany words for many 21st century concepts. Among the missing words is 'globalization.' And yet few people in the world are having more difficulty confronting globalization than the Roma in Hungary. Under-employed, under-educated and often alienated, they feel excluded from the young democracy's growing prosperity. And yet many Hungarians feel the Roma have bought this exclusion on themselves. Roma make up a large percentage of Hungary's prison population, and have few leaders who have been successful in the wider world and are prepared to stand up for their Roma, or 'gypsy', inheritance. Radio C is in District 8 - informally known as Gypsy Harlem. It's long been the center of Budapest's gypsy culture, known across the world for its musicians. But 'gypsy' artists here face a dilemma - if they sell themselves as gypsies, they're regarded as quaint representatives of an ethnic minority. 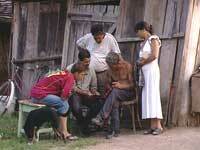 In the words of Roma writer Andrjz Mirja, the dilemma for the Roma is "how to be a minority but still be equal." In Escape from Gypsy Harlem Arpád Bogdán, a prize-winning Roma filmmaker ('Boldog új élet - 'Happy New Life'), describes how he and his friends have faced this dilemma in their working, and personal, lives, and takes us on a tour of Gypsy Harlem, The Jungle - an even tougher neighborhood in Budapest - and the more tranquil Rose Hill, where he now lives, looking for answers to the question of how to escape the gypsy artist cliché in a globalized world. "A well-crafted and heartwarming film and is certainly recommended especially for school and public libraries."